An official of Nevis’ 38th annual cultural festival, Culturama 2008, described the just concluded summer event as successful. Chairman of the 2008 Festival Mr. Halsted “Sooty” Byron, told the Department of Information on Monday August 06, 2008, that preliminary indications were that the event from July 25 to August 5, 2008, held under the theme “Participate make it great Culturama 2K8” and the patronage of multi folklorist Mr. Norman Liburd went well. “I thought Culturama was very successful. Generally speaking beside a few skirmishes the event went well. We had a nice build up to Culturama with the street bashments leading up to the start of the festival. We had great support from the public who came to listen to the local bands. “We were quite pleased with the high quality and content of all the shows. We were a little disappointed in the attendance at the Cultural Complex, the attendance was not as good as we expected but the Band Clash on August 01 and the Buju Banton Freedom Concert on August 04, were massive crowds in the Cultural Village,” he said. Mr. Byron referred to the Festival’s Food Fair as “big and well organised” with a record 40 booths and an art and craft section. With regard to the J’Ouvert jump up he said it was the biggest Nevis had seen in the history of the Festival. “J’Ouvert Emancipation Jump Up, was probably one of the best and biggest we have had; so too was the Cultural Street Parade,” he said. 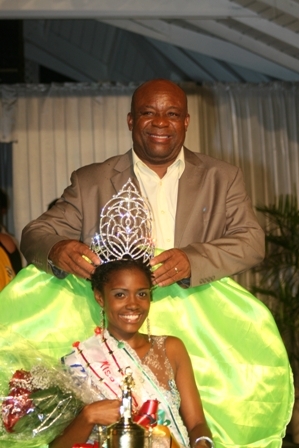 A Press Release issued by the Culturama Secretariat on July 06, 2008, indicated that the Bmobile Ms. Culture Swim Wear Contest Best One-Piece and Best Two-Piece were captured by Ms. Tanisha Hendrickson while Ms. Shanyra Richardson won Best Cultural Wear. 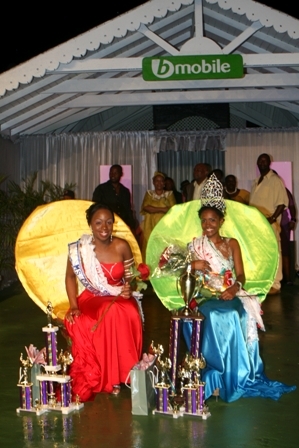 For the Ms. Culture Pageant, Ms. Tanisha Hendrickson was crowned queen and 1st runner up was Ms. Shanyra Richardson. Hendrickson also walked away with the Best Interview and Most Photogenic titles while Ms. Richardson also won the Best Talent and Best Evening Wear. Best Ambassadorial Wear and Best Promotional Speech were won by Ms. Roslyn Berkley. For the Bmobile Mr. and Ms. Talented Youth Pageant, the Charlestown Primary School represented by Ms. Joneika Smithen and Master Bryton Nisbett took the top spot while the St. Thomas Primary School represented by Ms. Myra Jeffers and Master K-Jel Smithen placed second. The Best Independence Wear and Best Talent were also awarded to the Charlestown Primary School and the Gingerland Primary School captured the Best Evening Wear. In the Junior Kaiso Competition, defending King De Inspirer (Master Husani Parris) won followed by 1st runner up Princess Nature (Ms. Kitanna Hanley) and 2nd runner up Lady Sunshine (Jazze Queeley-OConnor). Meantime history was made in the TDC sponsored Senior Kaiso Competition when De Inspirer copped the coveted crown. 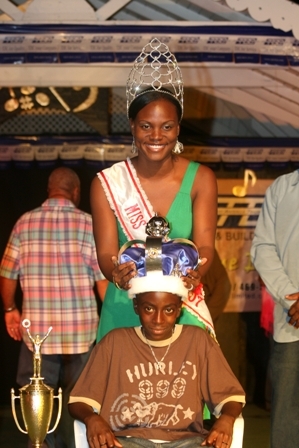 The 14 year old who is currently in Anguilla to represent Nevis in the Leeward Island Kaiso Monarch Competition on Saturday August 09, 2008 was followed by 1st runner up Pungwa (Mr. David Patrick) and 2nd runner up Baker (Mr. Alfred Newton). Veterans Kasanova Band from Gingerland won the first ever Band Clash title. Road March Winner was won by a new group from Bath Village – Ultimate Band, with their song “Love Ultimate”. The 2008 Culturama Festival was first held in 1974 for the revival and preservation of all aspects of the Folk Arts on Nevis.